In this fourth of a series looking at the wisdom of great investors, we focus on the perils of trying to time the market. If you’ve heard the saying ‘it’s time in the market, not timing’ this is what we’re talking about…timing the market is usually a loser’s game. 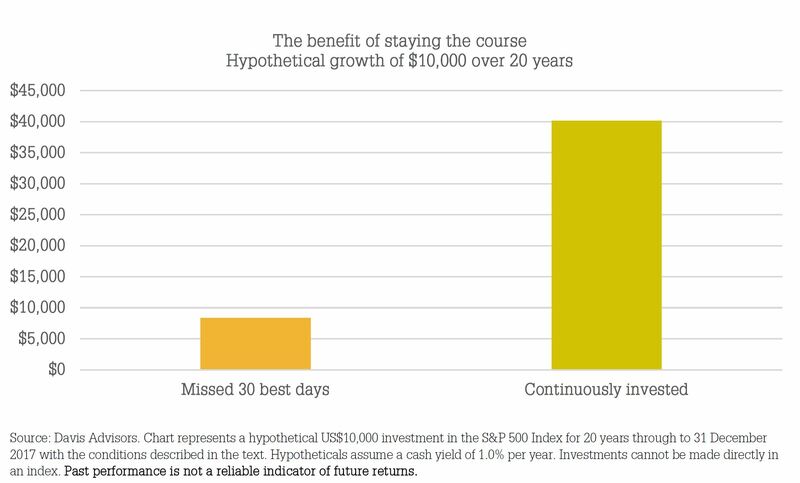 It often occurs when an investor believes they can predict when the market will fall or rise and base their investment decisions on this prediction. Fear and greed can also cause investors to rush in and out of the market at inopportune times, buying as stocks rise (or have peaked), selling as stocks fall (or have bottomed). The cost of missing the 30 best days is substantial. None of PAN-Tribal, Davis Advisors, Equity Trustees nor any of their related parties, their employees or directors nor any other person guarantees the repayment of capital or the performance of the Fund(s) or any particular return from the Fund(s). No representation or warranty is made concerning the accuracy or reliability of information contained in this document, nor liability accepted to any person who relies on it. Past performance should not be taken as an indicator of future performance and is provided for illustrative purposes only. Peter Lynch is not associated in any way with PAN-Tribal Asset Management or Davis Advisors. This document was issued on 30 October 2018. © 2018 PAN-Tribal Asset Management Pty Ltd.